Matt Harkins and Viviana Olen got their first taste of fame when they opened the Tonya Harding and Nancy Kerrigan 1994 Museum in their tiny Brooklyn apartment in 2015. The project raised more than $2,000 on Kickstarter (the original goal was $75), attracted guests who are celebrities in their own right—like Nanette Burstein, the director of the "30 for 30" special The Price of Gold—and earned Harkins and Olen the title of "World's Worst in Sports," graciously handed to them by Keith Olbermann. The duo's next project is inspired by Chicago artist Laura Collins and focuses on a different famous pair: Mary-Kate and Ashley Olsen. 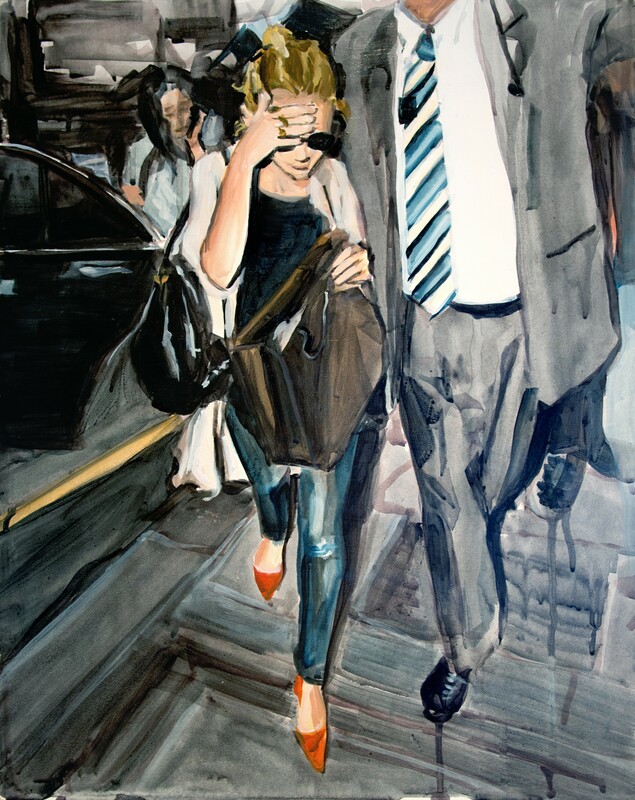 Collins is a painter who is fascinated by celebrity—her portfolio ranges from depictions of Marilyn Monroe to Kanye West interrupting Taylor Swift at the MTV Video Music Awards. She met Harkins and Olen after she submitted a print titled Tonya Harding's Mugshot to the THNK1994 Museum. They became fans of her work, in particular a series of the Olsen twins hiding from the paparazzi. The next exhibit for their museum was born. "I was planning on doing a series of just celebrities in general hiding from the paparazzi," Collins says. "Then I realized there were a ton of just the Olsen twins hiding, so I went with that. I just think they're fascinating people." While the concept is a bit whimsical, Collins's style is serious, infusing gravitas in an image as ridiculous as Kim Richards (The Real Housewives of Beverly Hills) bandaged up after a nose job. It's the same combination of snark and affection that Harkins and Olen brought to their original exhibit, so it's no wonder that they were drawn to Collins's work. 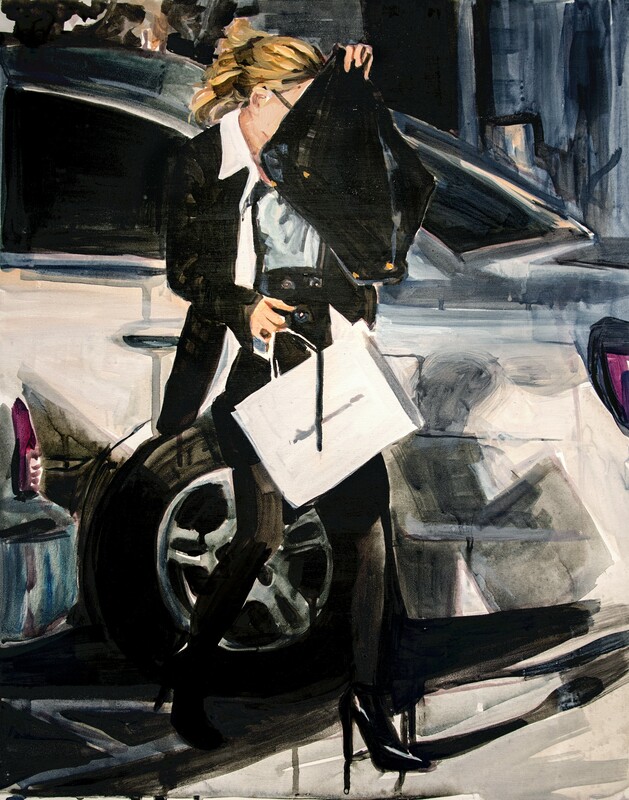 The entire "Olsen Twins Hiding From the Paparazzi" collection, along with a few more of Collins's pop-culture gems and a smattering of satirical work from other artists across the country, will be on display in an old medical office in Williamsburg starting on April 22, but until then, the work will be up in Chicago. Dollop Coffee at 343 S. Dearborn currently displays the Olsen-twin series, while the shop's Streeterville location (345 E. Ohio) has Collins's series of models falling down on the runway. And who knows? They all might return to receive the star treatment in Chicago once the New York exhibit finishes up in May. "It would be a dream come true to then do something similar in Chicago," Collins says. "I know that once it ends in New York I'll be itching to bring it all back." The former child star talks about Fuller House, urban legends, and appearing at her very first comic con in Chicago this weekend. A touring exhibit inspired by the film stops in Chicago. A jaw-dropping ongoing show focuses on the impact of opera on Chinese visual culture. He shows us what follows from our culture's obsession with objects and appearances. On a single canvas he leads us through the dream of a fetishist, from sensual pleasure to fixation to alienation and death.